If you have a lengthy amount of text to read or review that you don’t have time to actually read, another alternative is to convert that text into an audio track. This is kind of like making an audiobook out of any text block, and it can be as long or as short as you need it to be. Of course it sounds complex to convert text into audio files, but it’s not at all, Mac OS X makes it extremely simple. In a few moments, you’ll have a fresh MP3 audio file from the origin document, added to iTunes that you can then sync to an iPhone, iPad, or iPod touch. Sounds awesome right? 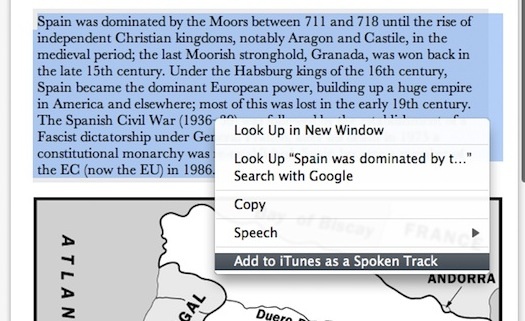 It is, here’s how to use text to speech on the Mac to speak selected text and save that spoken audio as an audio file, and it works it in all versions of Mac OS X. The audio track will then open up in iTunes, give it a listen, it sounds great. This will also record in the default voice, but with the myriad of realistic new voices available since Lion this feature is even more useful, because by changing the system voice you can also change the voice recorded used for the audiotrack. This feature is included by default in modern MacOS releases, including MacOS Mojave 10.14, Sierra, High Sierra 10.13.x, Mac OS X 10.7 Lion, 10.8 Mountain Lion, 10.9 Mavericks, El Capitan, and Yosemite. That doesn’t mean earlier Mac OS X releases are left out however. Now you just need to close up System Preferences and the option to convert text files and text blocks to spoken audio is enabled. To access the feature, just right-click on any text block and select the “Add to iTunes as Spoken Track” option from the pop-up menu. You’ll then see the Services gear churning away in your menu bar and in no time the file will be automatically loaded into iTunes as a spoken audio track. That screenshot comes via MacGasm. This follows the same convention as the command line method in that the default voice is whatever you set your Mac’s text-to-speech voice option to, you can always change that in the Speech preference pane. When i try this it creates the file and automatically sends it to the trash bin… any ideas why? It is supposed to send to iTunes, do you have iTUnes not set to the default music player? If you didn’t already figure it out, it sends a file copy to your iTunes folder and a the “leftover” file to trash. Make sure you select “Add to iTunes as Spoken Track”. Get the new voices for Lion. SO much better. Need a way to set default voice used. 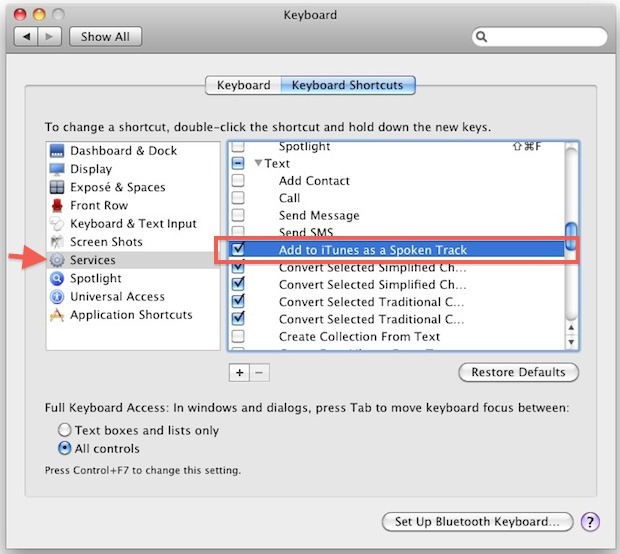 “Speech” option below Spelling, Proofreading, and Font but when I select “Speech” I get the only two options, “Start Speaking” or “Stop Speaking” I do NOT get the option to Add to iTunes as a Spoken Track, even though that is checked in my Services folder. Also, how can I select a different voice from the horrific Finnish accent that must be default??? I’m really hoping your answers will be exactly what I need for my project. Thanks in advance for your help. How do you modulate the speed? Changing the speed setting in preferences doesn’t affect it. There should be a way to download more voices to use. I heard my spoken text singing on an instrumental voice, which got me thinking…can I download music genres for voice options?